A race based on the Persocoms from the anime ‘Chobits’. Being mecha, the Persocoms are built to withstand physical attacks, but are weak against Shock magic to balance it out. I wanted this race to be as fair and balanced as possible, while still being a true mecha-type race. 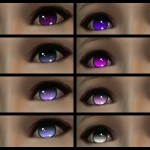 For this race specifically, I have made a set of 30 eye textures, designed to resemble those from the anime. 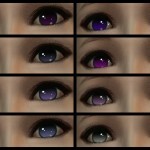 In this version, however, I have added in my old mod, Anime Eyes, and the two sets of eyes from my Doll Race, and new glow versions of every single eye, bringing the total number of eye choices to 176. Alongside the original hairs from Ren’s Beauty Pack and the Corean and Saram races, I have added hair from the Sulhwa race, HS-Hair, Soya Style, Babe’s Hair, the 2CH Hair Explosion set, three of Fallen20’s conversions, all the hair released by KumaKumaKokuma and a special hair made by me. A grand total of 163 hair meshes for you to choose from. Oh. And they still have barcodes. Start Oblivion Launcher, click Data Files, uncheck DesuChan’s Persocoms RECONSTRUCTED.esp. Version 3.0+: This mod has been thoroughly tested and cleaned to ensure that there is no incompatibility with any other mod barring any older versions of the Persocom race. the Persocom is One of my favourite characters. Good to see you back in business Ani. You were sorely missed.